(Miami Herald) A Delta IV rocket will light up the evening sky Wednesday, launching a new weather satellite that will give forecasters a little better look at hurricanes, tornadoes, flash floods and other bad weather. 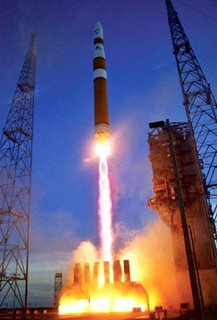 But GOES-N will begin its life as an orbiting spare, not likely to see action before 2008. That's unless something goes wrong with its cousin, GOES 12, already standing watch over hurricane-prone areas such as Florida and the rest of the southeastern U.S. The launch from the Canaveral Air Force Station is set for a window between 6:11 and 7:11 p.m.
GOES-N, though not significantly different from other GOES satellites, has a new tracking system and bigger batteries, said Steven Kirkner, GOES-N program manager for the National Oceanic and Atmospheric Administration. It also has improved data quality and faster transmission. The new tracking system allows the satellite to better zero in on weather events ranging from hurricanes to storm systems that can trigger tornadoes or flash floods. the data will help forecasters on the ground pinpoint the warning area, Kirkner said. Closer to home, ''it strengthens our most critical resource,'' said Ed Rappaport, deputy director of the National Hurricane Center in West Miami-Dade. The new satellite is better than anything now in use, but not so much so as to warrant dumping one of the existing satellites and altering the current replacement pattern, officials say. Besides, it will take nearly nine months to test the satellite and its ground systems before it becomes operational. That will also give engineers time to make changes, if necessary, in two more GOES satellites under construction in this series. When it becomes operational, the bigger batteries will eliminate picture-blackout periods of up to 72 minutes a day during six-week periods in the spring and fall. During those times, the earth briefly blocks the sun from the satellite's solar panels. That means forecasters at the National Hurricane Center are sometimes without images for more than an hour. If a hurricane is close to land, it is already being monitored by hurricane hunter reconnaissance aircraft and in some cases ground-based radar, so the loss of imagery is not as critical, Rappaport said. The satellite is more important for mariners who might be facing a major storm while out at sea. The $475 million satellite will become the 13th in a series of weather watchers that have looked down from over the equator since 1975. It will be a spare until GOES 12 runs out of fuel, which could be as late as 2011, or until GOES 12 malfunctions. It is likely GOES-N will be put into service well before 2011, officials say. The satellite will be ''parked'' while it is tested for 24 days by its builder, Boeing, and then turned over to NOAA for 200 days of testing.